You can find biryani dishes in Indian restaurants – rice is the most common and most popular one. Ever since I tried rice prepared this way, when I order curry, I have biryani rice with it. The rice cooked on water tastes quite plain. Whereas combined with a selection spices it becomes unique. As you will see from the below rice is not the food you can make in biryani style. Instead of rice I used cauliflower. Meatballs or chicken kebabs will go very nicely with it. Ingredients for making biryani cauliflower. 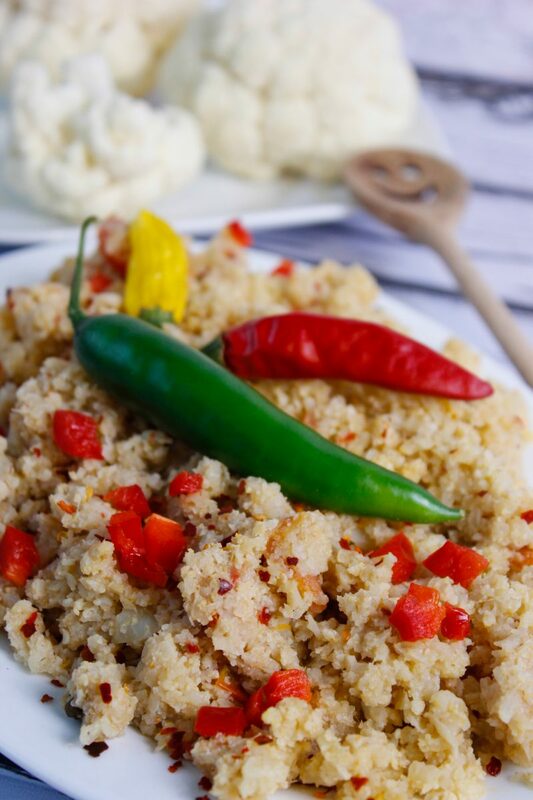 How to prepare cauliflower with spices. Remove the leaves from the cauliflower and wash it. Cut it into four parts. Grate off each part on a large-mesh grater. 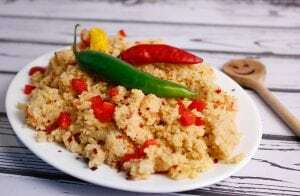 The consistency after grating should be similar to that of cooked couscous. Put the cardamom, bay leaf, cloves, coriander and chili flakes into a frying pan. Leave it on low heat for ten seconds. Increase the heat to medium temperature and add coconut oil, ginger, coriander, pepper, mango powder, saffron and grated cauliflower. Keep the heat on medium. Simmer the cauliflower for two minutes, stirring thoroughly in the meanwhile. Add the vegetable broth to the frying pan along with cherry tomatoes. Season with salt. Cook for another eight minutes, stirring continuously. Serve as an addition to meat dishes or by itself. What you need to know when making biryani style cauliflower. I used some spices from Indian cuisine to make this dish. They are irreplaceable if you want to achieve an effect similar to the original. If you want the dish to have a sharper taste, use a fresh pepper instead of dried chili flakes. Roasting the spices “dry” will result in a more intense flavor. Do you like cauliflower? If yes, check out my recipe for White cauliflower soup with a twist.